Deliver 30% better speech intelligibility than other premium hearing aids* using Binaural Directionality II with Spatial Sense. Give patients vivid spatial awareness with exceptional sound quality, and as background noise levels rise, patients can zoom in on the sounds they are interested in without losing the sense of what is going on around them. Create an entire ecosystem of hearing aids, apps and wireless accessories so your patients can feel comfortable in any listening environment. Protect every component from moisture, dust, sweat and cerumen thanks to iSolate nanotech coating technology. Feature our 4th generation 2.4 GHz technology which allows for a strong stereo signal with practically no noticeable delay. Did you know that ReSound was the first to build 2.4 GHz technology for wireless communication into hearing aids? Use a unique spectral subtraction technology, Noise Tracker II, which reduces unwanted noise without degrading the speech signal. Provide a full family of BTE, RIE and custom designs that are comfortable, durable and discreet – a perfect fit for any of your patients. 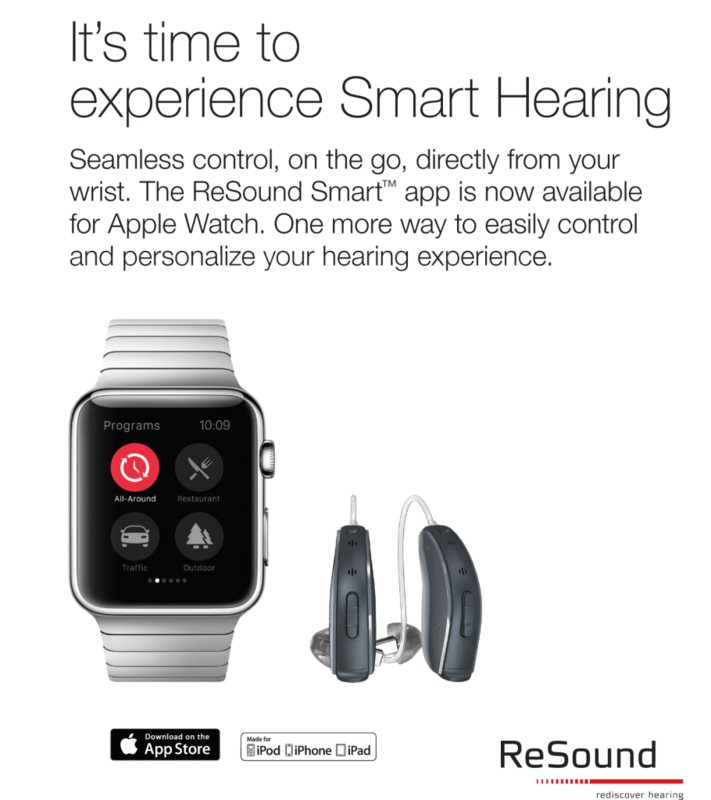 Personalize your patients’ hearing experience with the ReSound Smart™ app– all without them having to touch and draw attention to their hearing aids. Relieve the symptoms of tinnitus, with a wide range of soothing background sounds found in the Tinnitus Sound Generator. Denmark-based ReSound has been recognized for its ReSound Smart Hearing solutions through a number of awards it received over the last few weeks. In just a short period of time, ReSound has been awarded with four different industry and innovation awards in the United States and in Europe. The second award was granted at the European Business Awards, which focuses on the most innovative businesses on the European continent. GN Hearing was placed among the national champions for Denmark. Also in Europe, ReSound’s ENZO2 won the award for Power Hearing System of the Year, and the ReSound Smartapp also won Best Mobile App of the year at the Expo and Golden Lobe awards in Nottingham, UK, organized by AIHHP. Last but not least, the company won Die goldene Concha award in Germany from IAS (Individual Akustiker Service GmbH) for ReSound Linx2 in the BTE category, and best hearing system family. ReSound Linx2 achieved 19% of the votes cast by all experts as part of the competition that included multiple competitors. ReSound has already been awarded a Best of Innovation Award in the Accessible Tech category for ReSound ENZO2™, the world’s smartest super power hearing aid for people with severe to profound hearing loss. The CES Best of Innovation Award recognizes outstanding design and engineering in consumer technology products.